CAMBRIDGE — All art is information, but very little information is art. Its rarity is one reason we prize art as much as we do. We prize information, too, of course, and for many reasons. Some of them emerge only over time. What’s that recurring phrase Saul Bellow uses in “Humboldt’s Gift,’’ “finding without seeking’’? Such after-the-fact reasons can be quite different from what the information gatherers thought they were looking for. The 50 or so items in “Spying on the Past: Declassified Satellite Images and Archaeology,’’ which runs at Harvard’s Peabody Museum through Jan. 2, are a case in point. The title is a perfect pushmi-pullyu of sizzle and sogginess. On the one hand, you’ve got “spying’’ and “declassified’’ — on the other, “satellite images’’ and “archaeology.’’ But that intersection of opposed elements is the essence of “Spying on the Past.’’ While it’s far from an exciting show visually, it’s fascinating conceptually. More to the point, the title flags the incongruous juxtaposition that defines the exhibition: modern technology, with its up-to-the-minute dynamic, being put to use (however inadvertently) to investigate the pastness of vanished civilizations and timelessness of nomadic existence. Who at Langley might have imagined that while the CIA’s CORONA satellite system was helping win the Cold War it was also providing a window on a very distant past? Even as super-secret eyes in the sky were looking for evidence of troop movements or missile launches, they were recording evidence of long-ago migration tracks and irrigation systems. Traces of such activities and structures, barely visible or even concealed at ground level, can be readily recognized from above. “Spying on the Past’’ consists mostly of aerial photographs, but also maps and drawings, photographs taken on the ground, and a video simulation of what was once the pre-Columbian city of Chan Chan, in Peru. There are also images of the Chan Chan ruins, one of four sites the show focuses on. The others are in Syria, Iraq, and Iran. The use of aerial photography in archeology well predates orbiting satellites. There’s a photograph in the show taken over Iraq by Britain’s Royal Air Force in 1933. Nor does “spying’’ have to be involved for an image to be photographed from space. Among the pictures here is one taken from the space shuttle Challenger in 1984. Satellite images predominate, though. The pictures are pinned to the walls, not hung. They’re unframed, unmatted, uncovered. The informality of display encourages a feeling of immediacy and sense of utility. The implication is that they’re up there to be purposefully inspected rather than aesthetically appreciated. In fact, most of the images are very much utilitarian in appearance: arrangements of gray, white, and black. They straddle the border between abstraction and representation. It’s easy to forget that maps aren’t themselves real, other than as pieces of paper or pixels on a screen. The reality is what they represent. Almost despite themselves, a few of the images are beautiful. One such is a 2004 aerial photograph of what was once the Assyrian city of Nineveh. It combines delicate and subdued colors with a stippled grid of tiny structures that has the shy, evasive purity of the best Minimalist art. 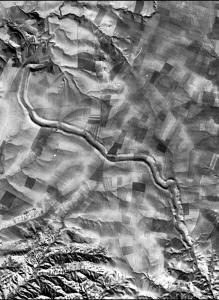 Another example is a 1997 aerial photograph by Georg Gerster of a site in what was once Mesopotamia. In strictly visual terms, it’s a study in color contrasts, with an almost voluptuous green surrounding a dun center. Mesopotamia: The name sounds as impossibly ancient as the dinosaurs. Yet what’s a few thousand years among civilizations? “Spying on the Past’’ carries with it a useful reminder of our own fleeting status on history’s stage. Soon enough the Cold War will seem as lost to the sands of time as Mesopotamia does now. The past is another country, one whose boundaries expand inexorably. It’s an empire where the living are the only undocumented aliens.